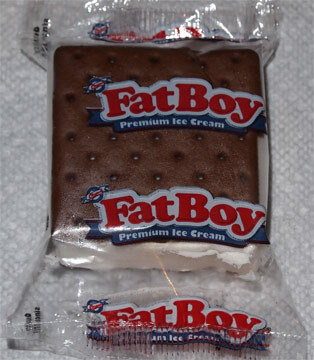 Long before Blue Bunny fattened up their ice cream sandwiches, and long before Klondike attempted to make their own thick, square ice cream sandwich, there was Fat Boy. And when I say long ago, I mean like 1920s long ago. It's pretty much a classic.... but I never saw it around here in Massachusetts until they built a new Price Chopper in my area. Now I was in no rush to try these since it's not a new product, but I stopped at PC yesterday and these were labeled "Discontinued Product: 50%". NOOOOOOOOOO!!! I know they are NOT being discontinued nationwide, but I can't miss my chance to try them! 50% Off FTW! If you aren't going to label the wrapper, then make it clear so I can see what's inside. I decided to eat my first one on the way to work, plus this is my first time with fat boy, so i might be a little vague here, but stick with me. As I start eating this sandwich, I notice something, a flavoring that I can't quite put my finger on. I try to take my time as my mind spins trying to figure out what it is. 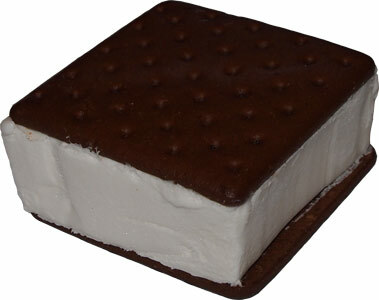 See, every classic ice cream sandwich should have this similar taste to it. It's just something that is, something classic. Fat boy has that thing turned up, but what is that thing? It's not quiet vanilla, it's similar, but more unique. Then it dawns on me. I taste softserve. In fact, I taste lots of softserve because of how thick this sandwich is. Cool, very cool. On Second Scoop: Just had my second sandwich and I like these, plain and simple. I mean, what would I possibly complain about? Nice wafer, nice filling, nice classic taste. I'm a sucker for the classics and this fits the bill just fine. It's just a matter of if you prefer the classic sandwich that's a little easier to eat, or if you prefer this sandwich so you get more flavor and texture from the filling. I can totally see people being addicted to the wafer to filling ratio and sticking with fat boy all the time --- yup, third sandwich even tastier. They grow on me more with every serving, even in breakfast sundaes. I buy these at Sam's Club for the kids. I like that they don't have HFCS or hydrogenated oil. Plus the ice cream is much nicer than the usual sandwich fillings. I saw cookie & cream Fat Boys at Kroger but I haven't tried those. exactly, the filling makes this one different, and have no fear, I'll be trying the other flavors as the year goes on. 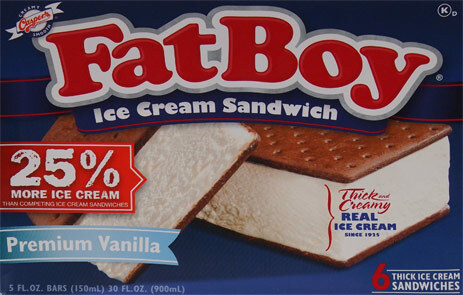 I love Fat Boys, my uncle is one of the head executives at Casper's Ice Cream, which is the parent company, and we get coupons for boxes of free fat boys all the time. Having said that if you bit into a metal washer in your fat boy then you should get to sue or have a large settlement or something, that's just not right. If they were trying to get rid of me for $20 of coupons I would go to the news. I've been in the food manufacturing process and it's very tightly regulated and controlled. One time a disgruntled employee snuck something into a food container (I won't go into detail on which company or what was in the bottle because I don't want to be identified and then sued by the company or something) but the owner of the company had to pay 250 million dollars to buy back all the product in the multi-state area that came from that factory just because of that one contaminated bottle. I have a correction to my last post, the owner actually spent $250,000 in recalls, not 250 million, still a lot of money, and he spent it out of his own pocket. We've loved the vanilla Fat Boys - yes - loved them. Then in the past week we tried the strawberry and cookies-and-cream flavors and were VERY disappointed with both. The strawberry seemed to have no real strawberry essence and the cookies-and-cream was almost flavorless. But BRAVO for the vanilla!